Looking for GoDaddy promo codes and coupons? #MasterTheWeb and save money today with our exclusive The Webmaster offers. This is a great Activation Link that gives you 30% off New Products. Please check the other coupons we have here first, as there may be better offers for "some" products. This activation link will give you $1 per month Economy Hosting + Free Domain. This is for their cPanel Plesk hosting product, so a great deal. You will see the offer in the orange bar at the top of the page, but the prices won't reflect the offer until you reach the checkout. This activation link will give you up to 28% off your first invoice of Virtual Private Servers..
That right, you can grab a Domain for just $0.99 for the year. You probably won't find a better domain price anywhere! Grab their popular Website Builder, free domain, and EMAIL for just $1 per month. One of the best coupons on offer. Firstly click on the “reveal coupon” or “buy hosting” button on one of the offers above. It doesn’t matter which, as all the offers are “link-activated”. This means there will be no Discount Code to enter in at the checkout. Instead, once you reach the website, you will see an orange bar displaying the offer at the top of the page. The coupon link should also take you to an appropriate landing page for your selected product. 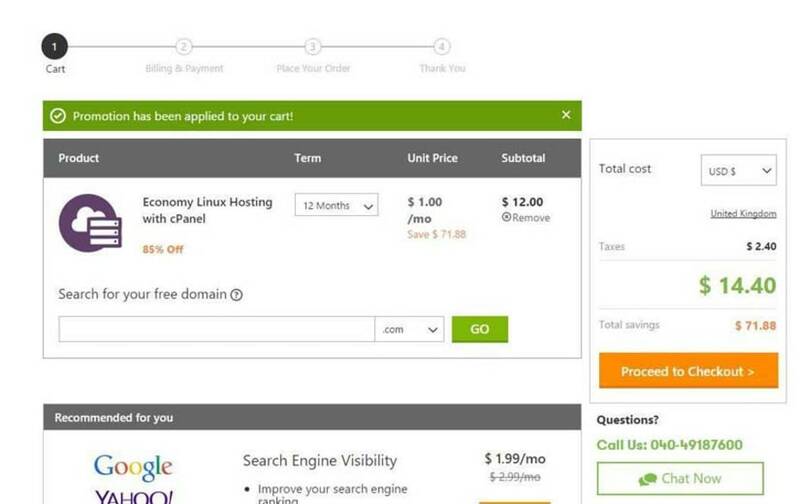 For example, see the screenshot for the GoDaddy cPanel hosting coupon. Click your chosen GoDaddy Coupon Code © The Webmaster. Once you have decided which plan you wish to purchase click “Select”. You should note carefully the different specifications between all the different plans, in particular, the fact that the Economy Plan is only suitable for one website. After choosing your plan, you will be asked to either choose your free domain or click the option “I Don’t want my FREE domain”. You may already have a domain, or you may wish to purchase it elsewhere. Remember that the domain is not included in your money back guarantee, so if you subsequently need a refund, they will deduct the cost of the domain from it. This will highlight all the aspects of your order, show the discounts applied, and any taxes due (i.e. VAT if within the EU). You will also have the opportunity to purchase any add-ons, such as the Search Visibility. Once you are happy, click “Proceed to Checkout”. Review and Customize your order © The Webmaster. The next step is just entering your billing information (if you are an existing customer you will have the option to log in to save the need to enter all your contact details in for a second time), and doing a final confirmation of your order. Your hosting \ order typically gets set up within minutes. This will very much depend on your requirements, such as how many websites you wish to host and how much you are willing to pay. There may be other considerations too. Their WordPress hosting is managed. This means they will take care of the security, caching but you will have no access to cPanel. Their cPanel hosting does not have all the performance and security enhancements but does offer more flexibility in how you wish to configure your website. It will also make it easier to move hosts in the future should you need to. Therefore, you will need to weigh up the options carefully before choosing the right plan and even speak to their sales department if you want more advice. Yes, many GoDaddy plans offer monthly billing cycles. What other billing cycles does GoDaddy offer? In addition to monthly plans, they offer three monthly and six monthly plans. Also, you make significant savings by signing up for 1, 2, 3, 5 or 10 years. Because you can lock in the initial savings by signing up for longer periods, this is something you may wish to consider. 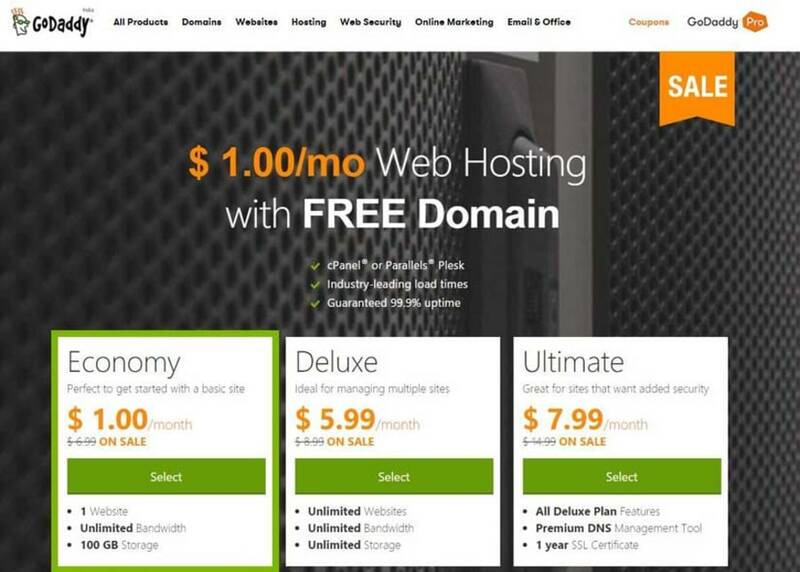 Does GoDaddy offer a free domain? They do offer one free domain with their hosting products. You can specify the free domain when you sign up. GoDaddy accepts many different methods of payment, but it does vary from country to country. In the United States, for example, they accept VISA, MasterCard, Amex, Union Pay, Discover, JCB and Diners Club cards. They also accept PayPal, GoDaddy Gift Cards, and money order, check & Wire transfer via a service called Good as Gold. They do not accept payment using Bitcoin or other virtual currencies. If you do need Bitcoin hosting, then we recommend Namecheap. If you have purchased a product with an annual plan, you can request a refund within 45 days. If you have a one-month free trial, then you may apply for a refund only within 15 days of the expiry of the free trial. After the time, periods specified above you may request a refund, but that refund will be prorated and will take the form of an in-store credit. Because you will be using a discount coupon when signing up, the first invoice will be cheaper than subsequent ones. Your hosting fees will, therefore, rise upon renewal.